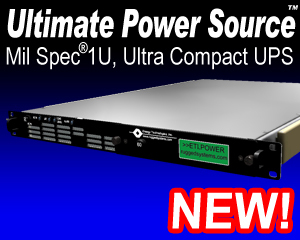 ETI0001-1250 is specifically designed for lightweightglobal power deployment or equally well in shallow depth racks. The internal shieldedinput transformer provides galvanic isolation with provisions forboth domestic (115 VAC, CONUS) and international (230 VAC, OCONUS) inputvoltages. The autoranging input voltage selection allows inputting either 115 VAC or 230 VACwithout having to open the UPS enclosure. Special EMI/RFI filters and inputpower factor correction minimize both input current and harmonics. The inputswitch and the galvanic isolation transformer provide a double pole isolated source for all installations including shipboard systems oroverseas locations where phase references and grounding are not consistent. ETI0001-1251 has the added benefit ofhaving a front drawout hot-swappable battery module. The LED arrays keep the operator informed as tothe unit's status including load and battery levels. The high intensity audible alarm canbe heard in high noise environments.All controls and protective devices are brought to front and rear panels with criticalswitches having finger guards. Further, all front panel devices are recessed to preventdamage or accidental operation. The rear panel provides lockingconnectors for the input and output power with various optional configurationsavailable. This reverse air flow version draws air through the front and exhausts out the rearvent into the rack. A removable and washable intake air filter and high capacitystainless steel ballbearing fan provide added protection in both controlled and hostile environments. The batteries are maintenance free with immobilized electrolyte and areconstructed of flame retardant materials. For more information, see the BatteryTechnology section. The twostatus D shell connectors provide both a contact and serial interface withoptional computer software providing loss of AC and low battery status as well as remote shut downcapability. Overall, the Military Power line is uniquelyqualified for critical shipboard, vehicle, airborne or land based systems combiningadvanced modular design features with highly reliable construction.